About the Book The book forms the third and final part of the plan of studying the Mahabharata - Quest for Immortality, Vol. 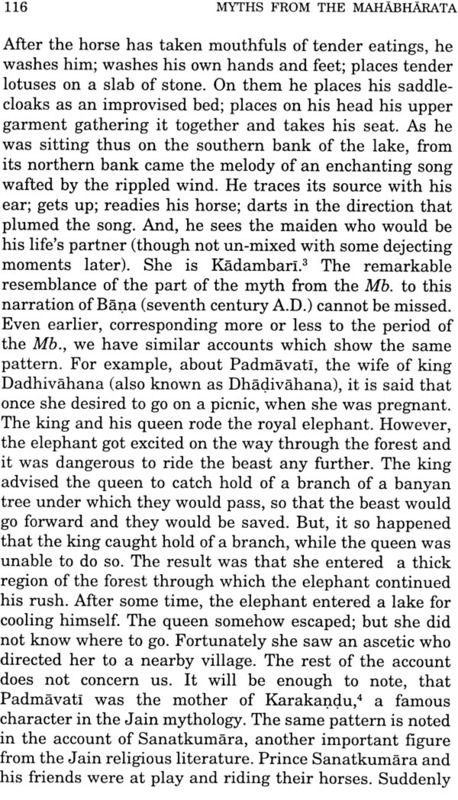 2 being - Myths from the Mahabharata - Study in Patterns and Symbols. In this volume are unearthed through myths some iti-ha-asa records, which shed light on the facts and incidents of the hoary past, as yet shrouded in mystery. 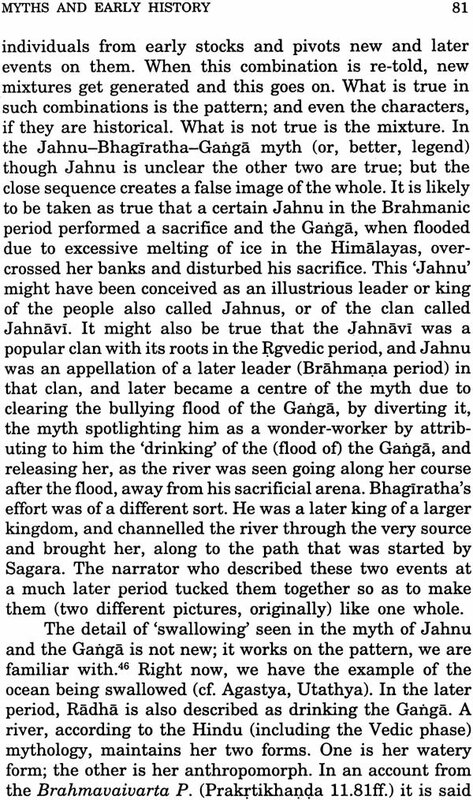 The iti-ha-asa records through myths such as those gathered round the sage Agastya and those of the advent of the river Ganga, can be taken as breathing the 'true history' from the modern day point of view. Some iti-ha-asa records in the Mahabharata as seen through the tales of "Metamorphosis" and the "Miscellaneous Tales" lead us to the study of 'patterns' and are a help to explain many a myth. The appendices serve as searchlight on some myths and folktales. Prof. Sadashiv Ambadas Dange, very well known in India and outside India well known in India and outside India for his contribution to the study of Indology and Sanskrit, is considered to be an authority on vedic-Hindu myths, rituals and practices. He formulated and delivered a course of fifteen lectures on Hindu Myths at the International Institute of Semiotics and Structural Studies, arranged by the central Institute of Languages, Mysore University (Dec. 1984 - Jan. 1985) and five lectures on Indian Myths and Symbols at the National Centre for Performing Arts, Bombay (1998). His numerous books include - Pastoral Symbolism from the Rgveda (University of Poona, 1970), Vedic Concept of 'Field' and the Divine Fructification (University of Bombay, 1971) Sexual Symbolism from the Vedic Ritual (Ajanta Publication , Delhi 1979), Encyclopaedia of Puranic Beliefs and Practices, Vols. I-V, (Navrang, New Delhi, 1986-90) and Towards Understanding Hindu Myths (1996), Vedic Sacrifices - Early Nature (2 vols., 2002) and Image from Vedic Hymns and Rituals (2002) - these by Aryan Books International, New Delhi. Prof. Dange had been R.G. Bhandarkar Professor and Head, Dept of Sanskrit, University of Bombay (Mumbai) and twice President of the Vedic Section at the sessions of the all India Oriental Conference (1980 & 1985). He was consultant editor for the Encyclopaedia of Human Ideas on Ultimate Reality and Meaning and Editor for the Indian Section Meaning, Toronto(Canada) for more than a decade. The honours conferred on him include - Silver Medal from the Asiatic Society of Bombay (1983), 'Special Honour' by the Uttara Pradesh Sanskrit Academy (1989), Felicitation by the State Govt. of Maharashtra (1990) and the Certificate of Honour from the President of India, to mention a few. The book Legends in the Mahabharata by Dr. Sadashiv A.Dange, has been out of print for a pretty long time, after it was notified as 'rare'(1980) by M/s. Motilal Banarsidass Delhi, which earlier published it in 1969.On the insistence of interested readers and scholars and of several publishers of interested readers and scholars and of several publishers offering to publish the book, Dr. Dange was urged to turn to the study of the Mahabharata again, though he was occupied with his projects on Vedic studies, which are now published under the tittles- (1) Vedic Sacrifices-Early Nature in two volumes and (2) Image from Vedic Hymns and Rituals, both by Aryan Books International, New Delhi, 2000. The original book Legends in the Mahabharata formed only a part of Dr. Dange's new plan of the Mahabharata-study with a title Myths from the Mahabharata, Vol.1 Quest for Immortality, which is published in 1997, by Aryan Books International, New Delhi. Myths from the Mahabharata, Vol.2: Study in Patterns and Symbols, is published by the same publisher, in the year 2001. I am presenting here to the scholarly world, Myths from the Mahabharata, Vol.3: Probe in Early Dim History and Folklore. I have to mention a detail regarding this volume and earlier volume (Vol.2). While writing these volumes (nearly 650 pages handwritten) in six months, Dr. Dange, with his undaunted courage, gave a tough fight to his serious illness and finally won the battle when he completed these two volumes, little before he left for the heavenly abode. My humble self, as his former student and later on his wife, associated with him for nearly fifty years, went through the whole manuscript, checked it thoroughly and prepared the final press-copy. The Introduction written by me, can serve as "Open Sesame" to the Itihasa-cave of this volume of the Myths from the Mahabharata. As per the wish of Dr. Dange, this volume of the Myths from the Mahabharata is dedicated to his esteemed friend Dr. Ram Gopal, as a token of abiding friendship. I entrusted the publication of this volume also to Shri Vikas Arya (Aryan Books International, New Delhi). He has been publishing our books since 1994. He has brought out this volume also, with elegance and sense of belonging, which are his innate qualities. My thanks are to Mrs. Vidya Joshi, Lecturer in Art, J.J School of Art, Mumbai, for the jacket-design with the picture. DR. Mrs. Vidya Kamat, who has been a student of Dr. Dange and myself, and has studied for her Ph.D. degree under my guidance, has prepared the Index, for this volume also, needless to say, with ardent devotion. The practice of preserving the narrations of various events can be traced to the period of the RV or even earlier. The source of these traditional narratives and compositions was the Vedic secular tradition, which thrived simultaneously with the Vedic ritual tradition. The Vedic secular tradition was mainly of the suta-s, who preserved and at times composed various accounts and narratives. The suta can be traced back to the AV (III.5.7) and the YV. The Sat. Br. mentions him among the ratnin-s, i.e. officers, at whose houses the sacrificer-king had to offer oblations in the Rajasuya sacrifice (V.3.1.5). The important role of suta is marked from the very composition of the Mb. and the purana-s. Sauti Ugrasravas, the son of suta Lomaharsana narrated the Mb. to the sages including Saunaka (Mb.Adi 1.5-21). The various akhyana-s and the upakhyana-s and the same were collected and faithfully preserved in the suta-tradition, and were narrated by Sauti Ugrasravas to the sages, as the Mb. point out at the very beginning. 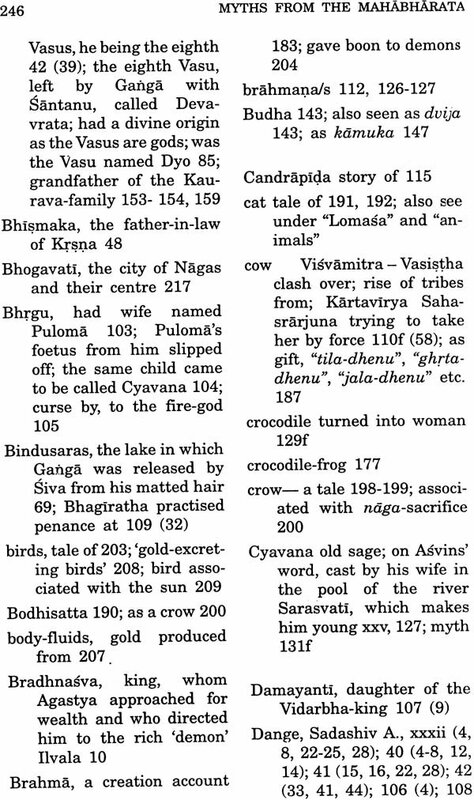 It is believed that the text of the purana-s was compiled by the suta due to the favour of Vyasa (Agni P.150.31). This shows that the suta was not only a chronicler and narrator but was also not composer himself. The nature of the Mb. as itihasa (iti-ha-asa i.e. 'This happed so' 'This was so') and as a repository of all knowledge lies in this role of Sauti-the suta- who was last and the final editor of the Mb. as is generally accepted. 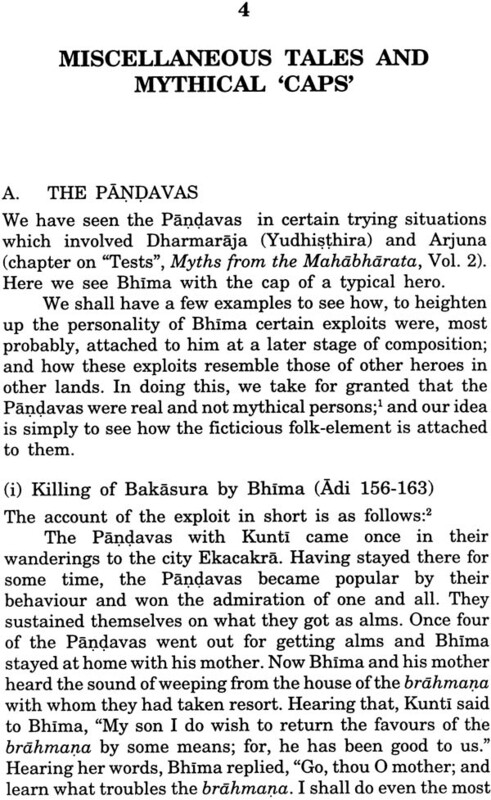 In Myths from the Mahabharata: Study in Patterns and Symbols, Vol.2, we have seen that myths are pressed into to show the divine origin of persons and thus make them established in a famous dynastic line. In this Volume, we shall try to unearth through myths some iti-ha-asa records, which at times shed light on the facts and incidents hidden in the hoary past, pointing out that these iti-ha-asa records can be taken as breathing the 'true history' from the modern-day point of view and also that the suta can be taken as the earliest historian of India. Some of the myths taken up here do follow 'patterns' in certain details, but their iti-ha-asa value is more striking, thus deserving separate mention. 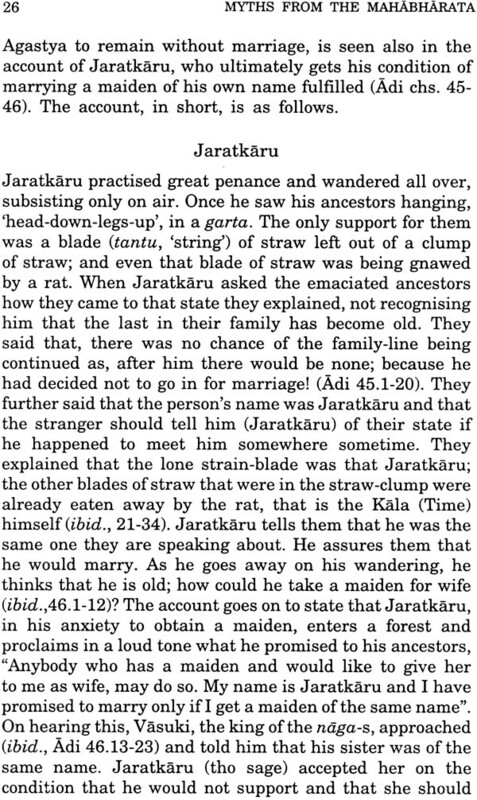 Some iti-ha-asa records in the form of folk-tales in the Mb. lead us to the study of 'patterns' from the point of view of folklore and are a help to explain many a myth. The turn to the myths in "Dim History"